M – I have to admit that this one is all Tammy as it didn’t really “feel” this game when I first saw it. Tammy picked it up a couple of times at our FLGS and put it down and it took a while for her to pull the trigger and buy it. 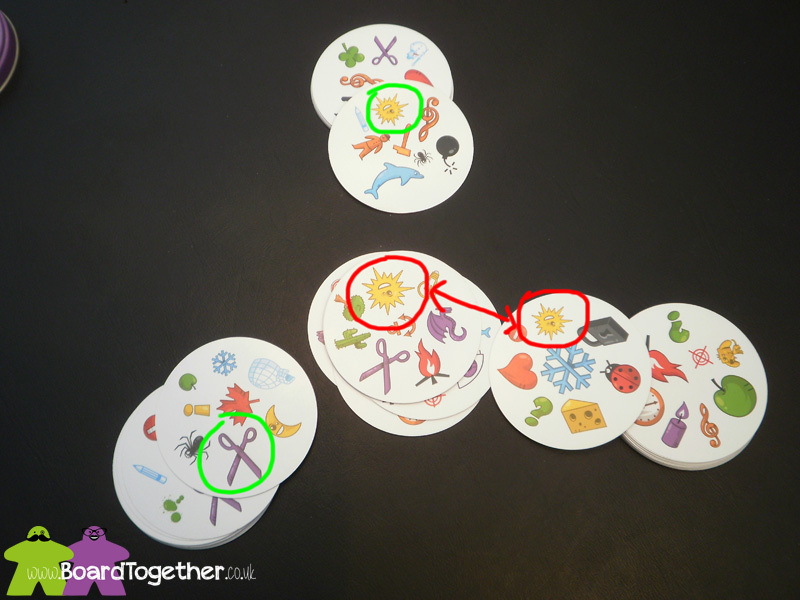 T – This is a great little family or filler game, a variant on Snap with different ways to play. Everyone can pick this up, you just need to spot the identical symbol on each card, no matter which game rules you choose. I love playing this game, it is one I totally get. As I said before it is my job to spot things. I do find my brain goes to mush and I cannot spot things or say them quick enough, so I have real problems with the time limit aspect! M – After playing the game I can see the appeal. 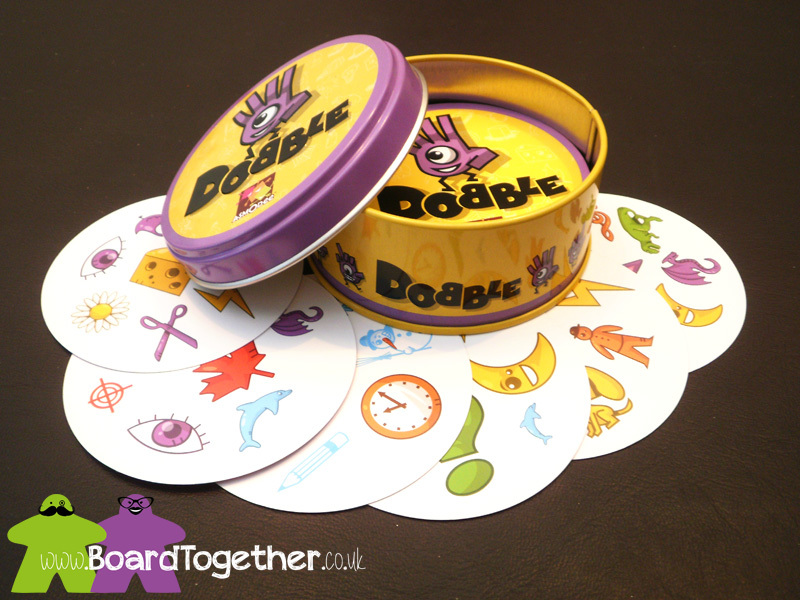 It’s a fast filler game that’s easy to learn so when you friends are around and your looking for something to play its an easy choice. Having multiple ways of playing the game helps with the longevity of the game. If it was a simple snap mechanic it would have hardly any appeal. T – We found a few problems with this game. Things get very competitive very quickly and in one particularly boisterous family game the cards were slapped down with gusto. In fact they were promptly bent in half! As the cards are an odd round shape they cannot be protected the normal way with sleeves. Hey ho. That same game we also found how easy it was to cheat. My Mother picked up how you concentrate on your own cards so closely that it is hard to keep tabs on others. She started to shout out random symbols without them matching. Was a bit disappointing when we found out she was cheating and we have refused to play it with her since!?! M – Focus is the main thing I found that helps with this game. Pick one of the images on the card and check to see if its on the card. That’s it really it’s an easy mechanic. T – The artwork is simple and cute. Easy to identify each symbol. It comes in a nice small tin with bright colours so it stands out. However everything is round, so it doesn’t really fit anywhere on a shelf neatly if you are a bit OCD! M – Simple imagery that’s cartoon like but works well as the images are different sizes on the cards. There’s no way that the images can be confused. 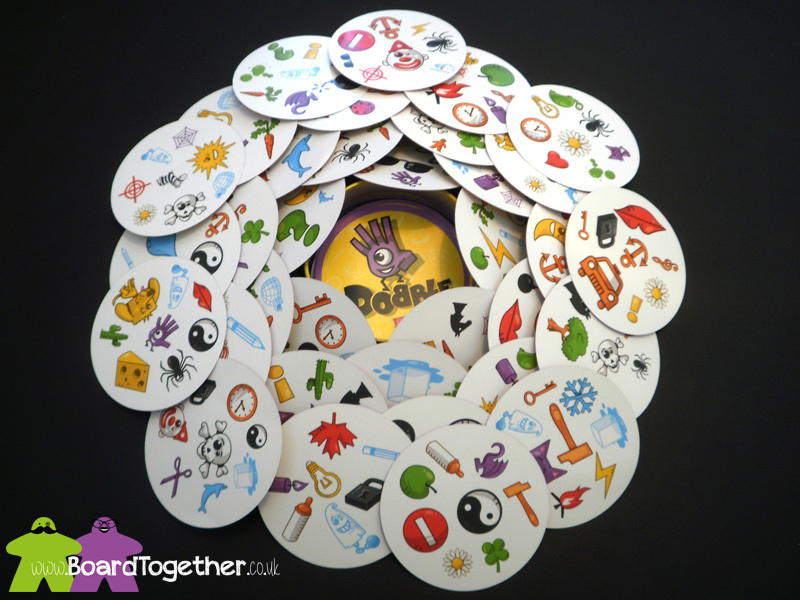 T – The cards are round and fairly flimsy for the way we play, so this game is getting tatty very quickly. As the cards are an odd round shape they cannot be sleeved and at £12 it is not that cheap to replace once completely worn out. Ah well, it gets a lot of play. M – The cards are of a good quality but will not hold out to the amount of games that will get played as the games are fast. Malifaux make playing cards that are made from a thin plastic that would work much better for this game. 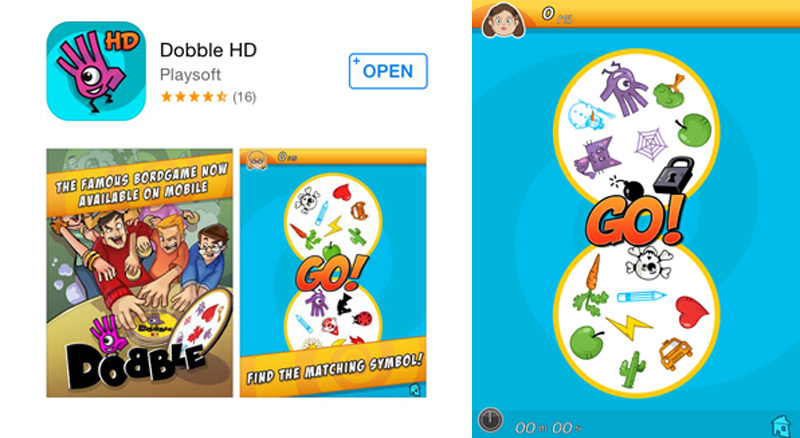 T – This games gets sooo competitive and you feel so stupid when you can’t find any matching symbols. It is hard to explain how much fun this game is without playing it! Give it a go, quick to learn, quick to win and sooooo satisfying when you do. M – It’s a simple game that’s over quite quickly so I think it’s a good idea to play consecutive games and take the best out of five games. Otherwise I think there will be quite a bit of luck in this game. M – I have to admit this isn’t a game that I would pick if playing with friends, it’s not my type of game. But if I’m not in the mood to go through rules or looking for something to play quickly then yes I would play it. 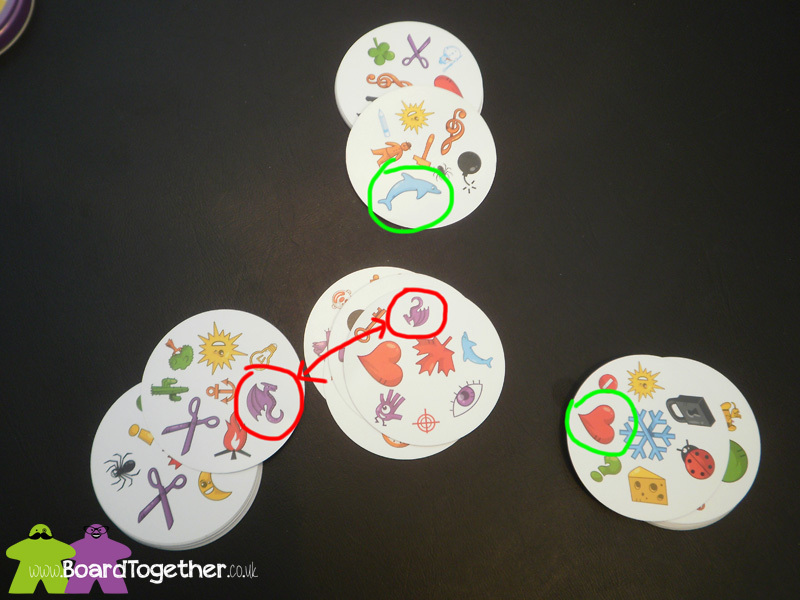 Player on the left has spotted that they can match the Dragon symbol, so shout it out and pop the card ontop. Player on the Right has noticed the Sun symbol matches. Top player also has a Sun symbol, but is too slow to shout out and put card down. 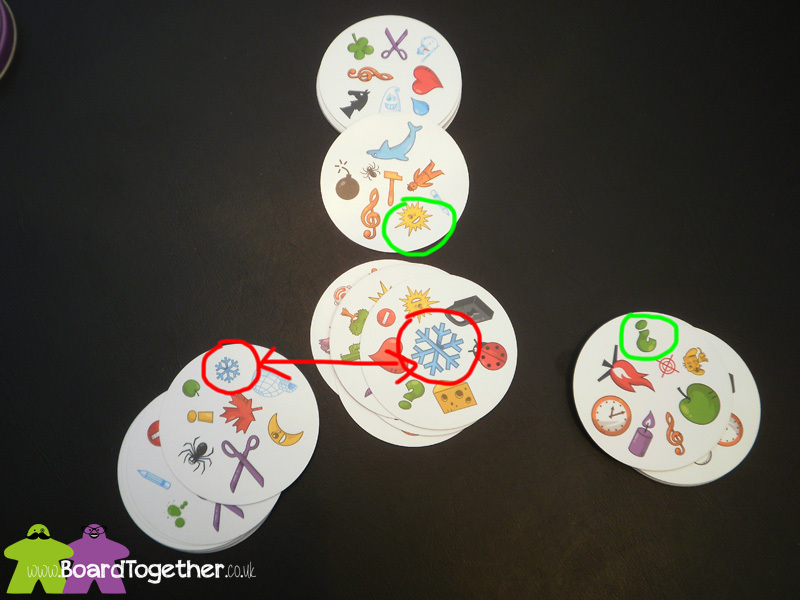 Left Player now spots the Snowflake matches, tricky spot as they are different sizes. There are 5 ways to play this game according to the rulebook. 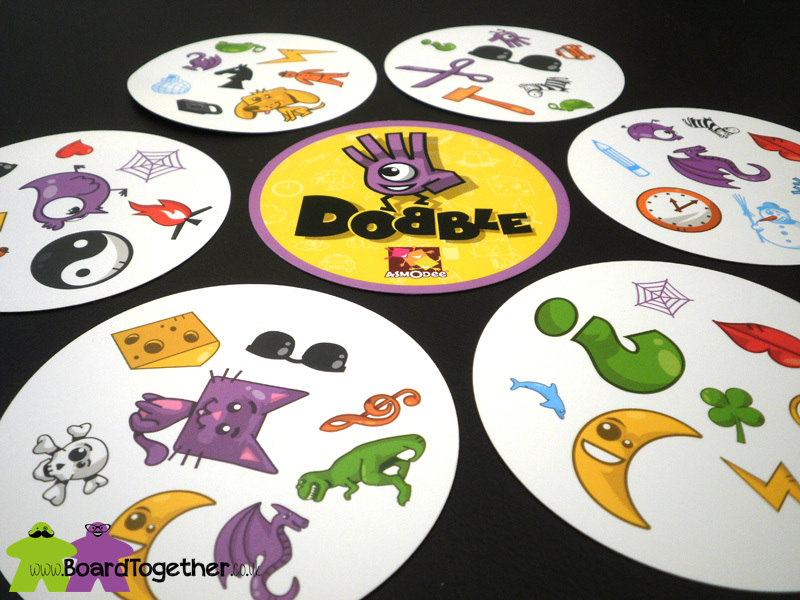 We like to play a few of these variations to decided who has won Dobble that session, as one game is just not enough! Object of the game is to match a symbol on one of these outer cards to the card in the middle. It does not need to be the card closest to a player. If you match correctly, take the card and put it to one side, never taking the middle card. 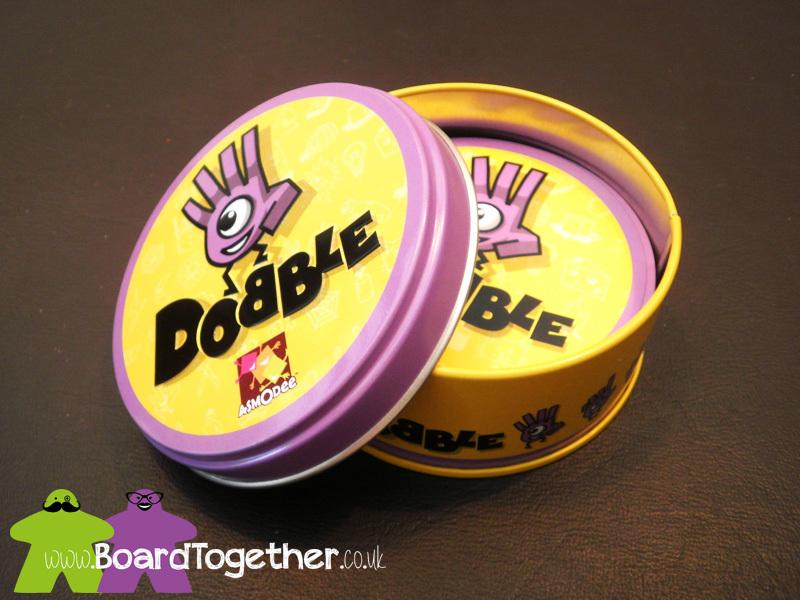 Want to know what other games to play with smaller children, check out this Board Game Geek list. The Dobble App is amazing. We love it. T – It frazzles my brain playing this game on my iPad, but I do enjoy playing against the computer when Mike has had enough of my antics with the real game! He wont play this version with me after I covered up the screen and then forcibly took the iPad off him when he was winning!!?! !